The 2008 Cleveland Browns season was the team's 60th season as a professional sports franchise and its 56th season as a member of the National Football League (NFL). The Browns finished with a 4–12 record and failed to qualify for the playoffs. The season marked Romeo Crennel's fourth (and what would be final) year as head coach of the Browns. Cleveland played all of their home games at Cleveland Browns Stadium in Cleveland, Ohio. 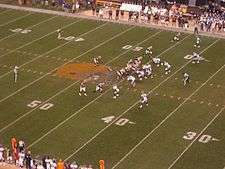 In the 2008 season the Browns failed to score a touchdown for 24 consecutive quarters. You are easily the worst GM in the NFL. Chud, Crennel and Tucker should NOT have jobs. How the hell do you play prevent defense the entire game? How do you NOT use Jerome Harrison more? Why the hell would you throw the ball with 6 minutes left? This is officially a regime that is worse than Butch Davis'. By the way, just like last week – this email was written while the Browns still had the lead. Coming off four straight losses in which their offense failed to score a touchdown, the Cleveland Browns played their final home game of the season in near-zero wind chills against the Cincinnati Bengals. The Bengals scored first, with CB Leon Hall intercepting a Ken Dorsey pass and returning it 50 yards for a touchdown in the first quarter. WR Chris Henry completed the scoring by adding on a 20 yard touchdown reception in the second quarter. The shutout marked five straight games in which Cleveland's offense couldn't find the end zone. The only bright spot for the Browns was RB Jamal Lewis, who became the 24th NFL player to reach 10,000 career rushing yards. Coming off five straight losses without a touchdown on offense, the Cleveland Browns closed out the regular season at Heinz Field in a Week 17 AFC North rematch with their hated rival, the Pittsburgh Steelers. The Steelers put up two touchdowns in the second quarter, a 34 yard run by RB Willie Parker and an 8 yard scramble by QB Byron Leftwich. The Steelers added 17 points in the second half (22-yard Jeff Reed field goal, 3-yard Gary Russell touchdown run, and a 32-yard interception TD return by Tyrone Carter), but they were unnecessary as the Browns were incapable of scoring at all, marking six straight games in which the offense couldn't score a touchdown (an NFL record 24 quarters). Again, the only good news for the Browns was RB Jamal Lewis, who topped 1,000 rushing yards this season. He would become the first Browns running back since Mike Pruitt in 1980 & 1981 to have back-to-back 1,000-yard rushing seasons. With the loss, the Browns ended their season at 4–12, with a record of 3–5 away from home. This also marked the Browns' eleventh straight loss to the Steelers. 1 2 Jackson, Zac (January 7, 2008). "Chudzinski signs 2-year extension". clevelandbrowns.com. Archived from the original on January 10, 2008. Retrieved January 7, 2008. ↑ Press Release (January 11, 2008). "Grantham not retained for '08". clevelandbrowns.com. Archived from the original on January 13, 2008. Retrieved January 12, 2008. ↑ Associated Press (January 11, 2008). "Poor defensive showing costs Browns coordinator his job". NFL. Archived from the original on January 18, 2010. Retrieved January 12, 2008. ↑ Jackson, Zac (January 12, 2008). "Tucker named defensive coordinator". clevelandbrowns.com. Archived from the original on January 13, 2008. Retrieved January 12, 2008. ↑ Press release (January 12, 2008). "Undlin named defensive backs coach". clevelandbrowns.com. Retrieved January 12, 2008. ↑ Crennel signs 2-year extension Archived January 31, 2008, at the Wayback Machine. ↑ Walcoff, Jeff (January 9, 2008). "'We'll do right by him'". clevelandbrowns.com. Archived from the original on January 16, 2008. Retrieved January 10, 2008. ↑ Notes: Thompson, Holly, others Archived March 3, 2008, at the Wayback Machine. ↑ Baxter's contract terminated Archived August 20, 2008, at the Wayback Machine. ↑ Browns, Bentley part ways Archived June 14, 2008, at the Wayback Machine. ↑ Wright's contract terminated Archived May 20, 2008, at the Wayback Machine. ↑ The Browns received two fourth round selections (104th and 111th overall) from the Dallas Cowboys in exchange for the Browns' fourth-round selection (#122 overall), fifth-round selection (#155 overall) and 2009 NFL Draft third-round selection. ↑ The Browns traded this sixth-round selection to the Philadelphia Eagles as a condition for receiving center Hank Fraley. The Eagles returned the pick to the Browns in exchange for the Browns' 5th-round pick in 2009. ↑ Browns keep Winslow's Staph from Team Archived October 31, 2008, at the Wayback Machine. ↑ Winslow Remains Hospitalized for Undisclosed Illness Archived July 21, 2011, at the Wayback Machine. ↑ Crennel Earns Coach of the Week Honors Archived October 21, 2008, at the Wayback Machine. ↑ "Browns suspend Winslow one game over critical comments". ESPN NFL. October 22, 2008. Retrieved May 26, 2013. ↑ Turner, Jamie (October 25, 2008). "Text messages back Winslow, prompt Browns to end suspension". Cleveland.com. Retrieved May 26, 2013. ↑ Quinn to start Thursday Archived December 6, 2008, at the Wayback Machine. ↑ Dorsey prepared for task ahead Archived December 5, 2008, at the Wayback Machine. 1 2 Jackson, Zac (December 16, 2008). "Thomas, Rogers Headed to Hawaii". Archived from the original on December 20, 2008. Retrieved December 16, 2008. ↑ Jackson, Zac (January 28, 2009). "Pontbriand added to Pro Bowl roster". Archived from the original on February 3, 2009. Retrieved January 30, 2009.